Bright was a 2017 Netflix film that starred Will Smith as veteran LA police officer Daryl Ward and Joel Edgerton as rookie orcish office Nick Jakoby. It is set in Los Angeles, but here, the city is a blend of humans, orcs, elves, and dwarves who live together in a sort of peace. Jakoby is the first orc to become a police officer and no one, human or orc, really likes the idea, least of all Ward, who is uncomfortable with his new partner. Things get worse after an orc shoots Ward, and Jakoby fails to catch the suspect. Mixed in with all the rest are Brights, those gifted with the use of magic. Brights and their magical instruments are hunted and contained as dangerous. 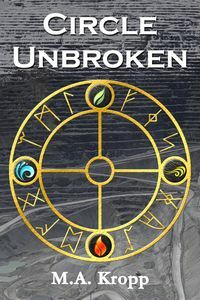 When Ward and Jakoby find an elvish Bright in possession of a wand, they get mixed up with bad cops, a human gang that wants the wand to cure their leader, and a magical cult bent on using the wand to resurrect the Dark One. Ward has to sort through all of the conflicting elements, and decide whether or not he can trust his new partner to help him save humanity from evil. Okay, it sounds kind of confusing, and in parts, it was. The movie is part cop buddy flick, part fantasy, and part dark social commentary. It gets its focus a bit mixed up at times, and tries to be both semi-serious and self-deprecating, and deliver a strong social message. It falls somewhere between the two and probably should have gone fully one way or the other. On the other hand, it wasn’t all bad. The futuristic LA setting is dark and gritty. The non-human races are handled well, if not perfectly. Magic is present but not a key part. The action is decent and generally doesn’t lag. There were some clever bits of dialogue, and the interaction between Ward and Jakoby is edgy and clearly uncomfortable. The movie got generally bad critical reviews, but public reaction was a bit better. For me, it was a decently watchable movie. ‹ PreviousTuesday Thoughts: Begin the Chili Season!